SQL Server offers specific functionality to keep the backup of SQL Server database in the form of full backup and differential backup. Such challenges causes great impact on backup so don't bother about it and must get deal with our backup repair services which radically deploy the recovery of SQL Server BAK files. Repair corrupt SQL .bak file elements: SP's, Tables, Functions, Views, Triggers and Rules. Recover Database Backup: Full and Differential. Preview Database Elements After Recovery: Tables, Functions, Views etc. Repair SQL Backup File of SQL Server 2000, 2005, 2008, 2008R2 2012, 2014. Perform Recovery of Selected Items from .bak file. Two export options: SQL Server database or SQL Server Compatible Script. 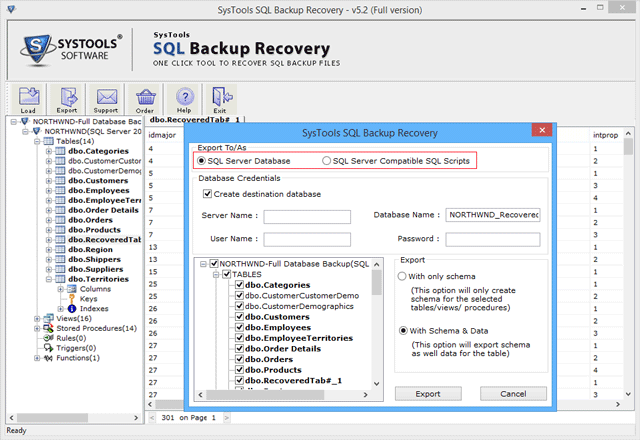 SQL backup recovery tool easily fix corrupt .bak file and perform quick recovery of backup file items like: Table, Stored Procedures, Function, Views, Triggers and other database components. Software can easily repair SQL backup file of any size. SQL backup repair tool provides the option to preview recovered .bak file elements like Table, stored procedures, Function. You can select the particular element by clicking on it and preview its data. 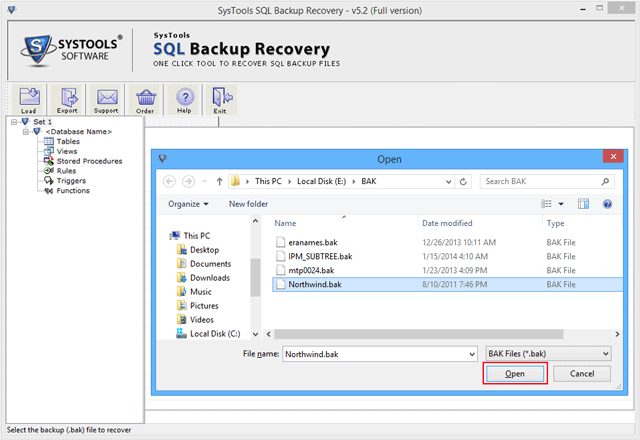 SQL .bak file recovery tool can perform recovery of SQL backups either the backup has been taken full or it has been taken after full backup. Software will preview the detail of your backup type and recover it instantly. Once the corrupt .bak file successfully recovered by SQL backup repair tool, the Software then provide two different options to save the outcome. You can export the recovered database directly to SQL Server database or export as a SQL Server compatible script. 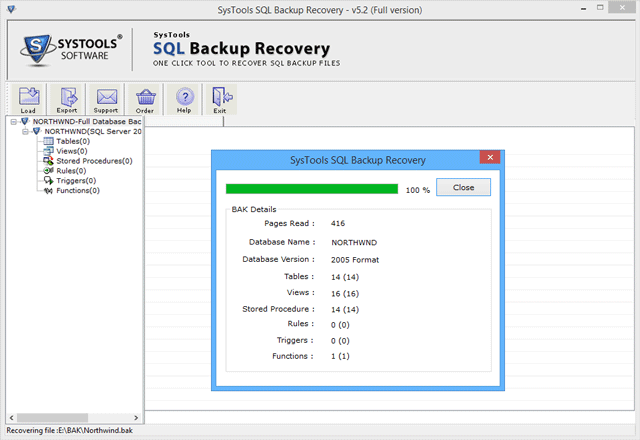 SQL backup recovery Software enables you to save the outcome of your database with two different options. You can save only structure of your database tables by choosing Export schema or you can save both schema and data by choosing schema with data while exporting. 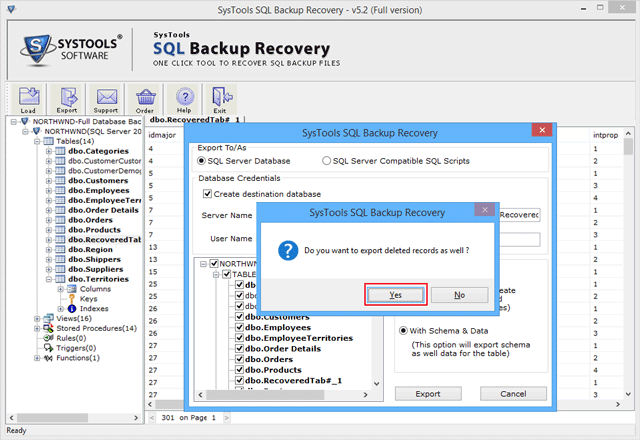 During the export process of recovered items, the SQL backup recovery tool allow you to export the desired database elements by check or uncheck them. Also the Software will ask you to export the deleted records as well. 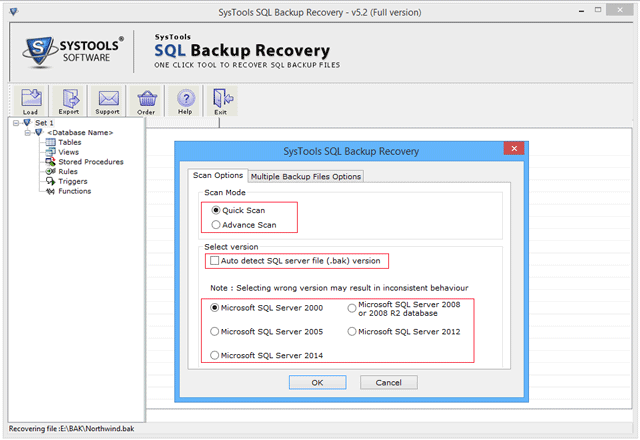 SQL backup recovery Software is capable to support SQL and repair corrupt SQL .bak file of SQL Server 2000, 2005, 2008, 2008R2, 2012 and 2014. Software has the feature to auto detect the version of SQL backup file. 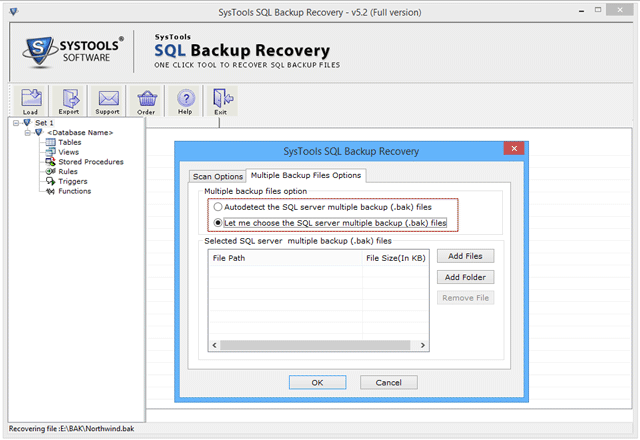 Once the backup file successfully loaded in SQL backup recovery Software, the tool will then ask you for Quick scan or Advance scan. Quick Scan: allow you to recover normal corruption. Advance scan: allow you to recover .bak file from heavy corruption. Select the scan mode to scan corrupt .bak file. Select version for .bak file by manually or Auto detect SQL .bak file version. Recover multiple .bak files by choosing one of the Multiple Backup file options. Also, select SQL Server multiple .bak files by Add files or add folder. Select .bak file and click on Recover button. SQL .bak recovery tool scan and recover the corrupt .bak file. SQL backup repair tool will ask you to export deleted records as well, then click on Yes. 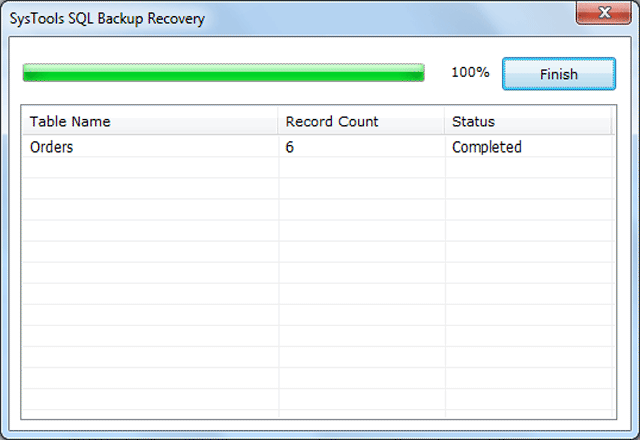 At last the tool completed backup recovery process and provide healthy .bak file. Our aim is to target audience suffering from troubles demanding for SQL BAK recovery so that the consequences of permanent SQL data loss are diminished. We strive to provide a complete satisfaction to customers with our advance technology and services. We own a flagship with recognized expertise in delivering optimum results for business continuity. 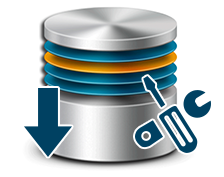 Our product is capable to endure SQL backup concerns and helps to recover unlimited databases from backup. Does this tool repair SQL database backup file of any size? 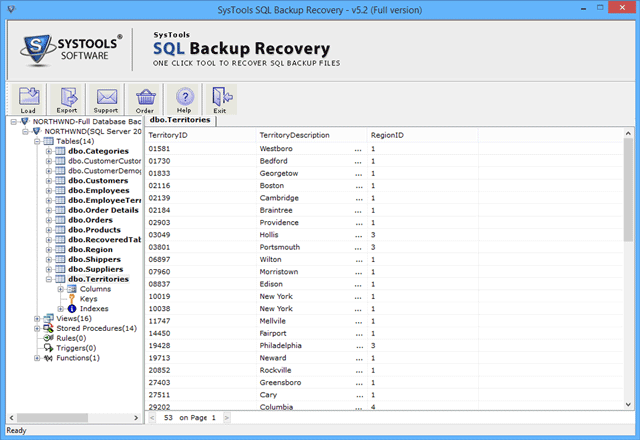 Yes, SQL Backup recovery software can easily repair .bak file of any size. Do I need to Install SQL Server to repair corrupt SQL .bak file? No, Software doesn't required to have SQL Server Installed on your machine to perform recovery of corrupt SQL backup file. Can I recover a corrupt backup file of SQL Server 2014 version? Can I perform recovery of differential backup using this utility? 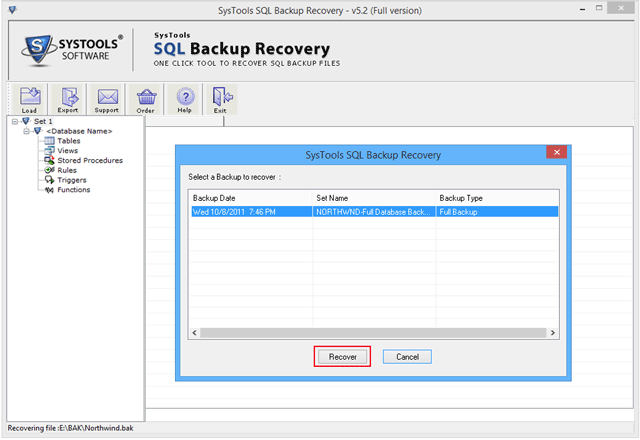 Yes, SQL Server backup recovery Software not only recover differential backup, it also recovers full database backup from a corrupt backup file. My SQL database backup file has been corrupted and I have need to recover its data. 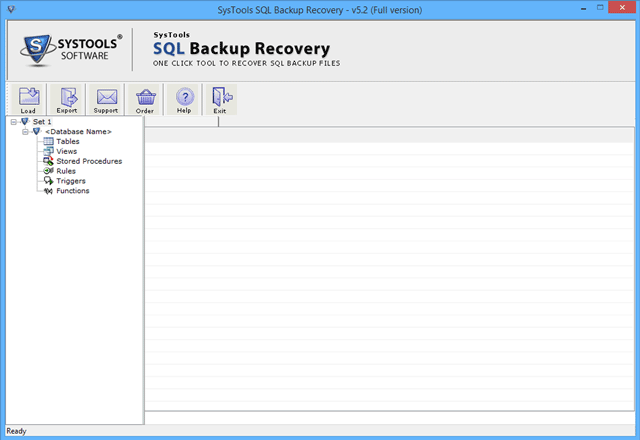 I found SQL backup recovery tool very useful as it not only help to recover data but also helped me to export BAK file data directly into SQL Server database file.